Kelowna’s residents, government and stakeholders are scrutinizing a two-tower project that, if approved by City Council, would be the tallest buildings between Metro Vancouver and Calgary. One Water Street is being co-developed by Florida-based North American Development Group (NADG) and Kerkhoff Construction of Chilliwack, B.C. The principals spoke to RENX by phone on Wednesday before hosting an open house in downtown Kelowna to reveal the latest designs for the proposed residential and commercial mixed-use towers, which would climb to 36 and 29 storeys. The buildings were designed by Kasian Architecture, which also designed the National Music Centre in Calgary, the Jim Pattison Outpatient Care & Surgery Centre in Surrey and the Charles E. Fipke Centre for Innovative Research in Kelowna. Kasian is also the designer of the new Kelowna RCMP headquarters, which is nearing completion. The towers would be “tall and thin”, designed and placed on the 2.9-acre site at the junction of Ellis and Water streets and Sunset Drive to protect views of the lake and mountains, said Don Kasian, the president of Kasian Architecture. He said the buildings will help add residents and businesses to the burgeoning downtown corner of the Okanagan Valley’s biggest city. 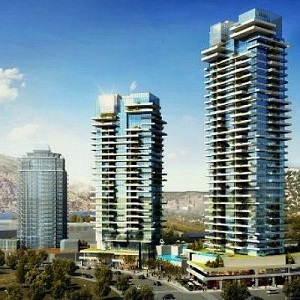 Both towers would surpass Kelowna’s current tallest building, Skye condo, which climbs to 26 storeys. “This really will add to the downtown community as much as anything could contribute to the city’s fabric,” Kasian said. If approved, the developers expect to break ground on the first tower by spring or early summer 2018. The first building is expected to take about 30 months to complete. Work on the second building would start a year later and would also take about 30 months to complete.The current legal address for the site is 1187 Sunset Drive, a former rail yard site that has sat vacant for several years. “Most Kelowna residents have been anticipating and wanting to see a project on this site for a really long time,” Kelowna Mayor Colin Basran told RENX Tuesday. “It was initially earmarked to be a major hotel, but for whatever reason that never materialized and it sat as what I called ‘the dirt pile’ for far too long,” he said. He said City Council will need to approve a height allowance for both towers for the project to go ahead as planned. “The heights they are requesting are higher than what’s allowed in the current zoning,” Basran said. The mayor said he supports, in general terms, more density in the downtown core. NADG partner Russ Watson said the project was initially envisioned as a wood frame low-rise apartment building. The current, bolder plan aims for a total of 413 residential condos, including studios, one-, two- and three-bedroom units and townhomes, Watson said. He said the commercial podiums would allow for about 15-17 businesses, including seven live-work units. “The owner will be able to operate a business on the street level and live above that business,” Watson said. The towers would help to pivot the north end of downtown Kelowna toward a better mix of homes, commerce and shops, he said.